You've just gotten into the swing of summer when suddenly you realize that school will be starting again before you know it. Don't let the school year sneak up on you this August. Try these suggestions to help make the back-to-school transition just a bit smoother! 1. Be sure your child is in good physical health. Take advantage of extra time in thesummer to get doctor and dental check-ups. If your child is playing a sport, get the physical as early as possible during the summer. 2. Read the school information. Review the materials sent by the school soon after it arrives. The packets may have pertinent information about your child's teacher, room number, school supply requirements, sign-ups for after-school sports and activities, school calendar dates, bus transportation, and health and emergency forms. 3. Mark your personal calendar with important dates like holidays and special events. 4. Create a family calendar for all to see with everyone's events marked: music lessons, scout meetings, sports practices, volunteer duties. Fill it all in. Clear communication helps cut down on family chaos. 5. Buy school supplies early. Get the supplies as soon as possible and fill backpacks a week or two before school starts. Make a list before you go of things your child absolutely needs and wait to buy things you aren’t sure of. 6. Go through your child's closet to determine clothing needs. Make a list of necessities and watch for sales. August is a great month for back-to-school bargains. Designate a budgeted amount that you can spend on each child and don't budge. 7. The week before school, re-establish the bedtime and mealtime routines. It's better to ease children into the change than have a painful withdrawal! 8. Visit the school with your child. If your child is young or in a new school, visit with your child. Meet the teacher, find their classroom, locker, and lunchroom. This will ease anxieties and allow your child to ask questions. 9. Prepare a place to do homework. Older children should have the option of studying in their room or a quiet area of the house. Younger children usually need an area set aside in the family room or kitchen to facilitate adult monitoring, supervision, and encouragement. 10. 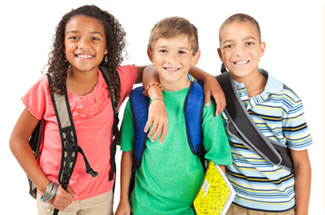 Select a spot to keep backpacks and lunch boxes. This is often for your sanity as well as for your child's. Designate a spot for your children to place their school belongings as well as a place to put important notices and information sent home for you to see. 11. Try to keep that first week of school simple. If possible, postpone business trips, volunteer meetings, and extra projects during the first week. You want to be free to help your children acclimate to the school routine and overcome the confusion or anxiety they may experience at the start of a new school year. 12. Make lunches the night before school. Older children should help or make their own. 13. Set up a school morning routine. If it’s helpful, make a morning checklist of things your child must do before school each day. At the very least, set a time for breakfast so you can be sure your child leaves with a full tummy. 14. The night before the first day, plan ahead. Set the breakfast table as you clear the dinner dishes, and plan what breakfast foods will be served. Have the kids lay out their clothes the night before. 15. If your child will come home to an empty house, be sure she know the rules and have phone numbers of neighbors to call if she needs something. Of course, clear this with your neighbors beforehand! 16. At the end of your child's first day, save some time to sit down and hear how it went. Talk about what your child will be learning during the school year and share your enthusiasm about the year ahead. 17. Send a brief note to your child's teacher. Teachers love to hear from supportive parents. Let them know you would like feedback on how your child is doing. Be sure to attend back-to-school night and introduce yourself to the teachers. Find out what their preferred method of communication is with parents (notes, e-mail, or phone calls). Let them know you want to help and support them during the year. Interested in our Advanced Features? Check out SignUpGenius Pro. 18. At back-to-school night, plan to volunteer in the classroom. If your work prohibits that, then look for other ways to help out. Maybe it's making something for the class or buying food for a special event. Perhaps you can arrange a day off to go on a fieldtrip or attend a class party. 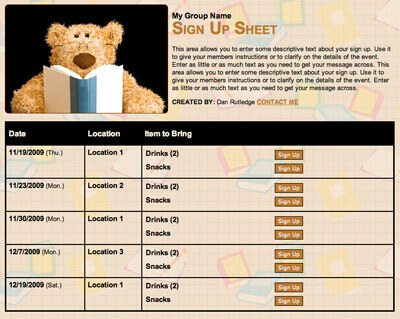 SignUpGenius provides great tools to help parents plan classroom activities and school events. See a sample HERE. 19. Be choosy when signing up your child for after-school activities. He will benefit most from one or two activities that are fun, reinforce social development, and teach skills. Too much structured time can be stressful, especially for young children, and may make it harder for them to concentrate on schoolwork. 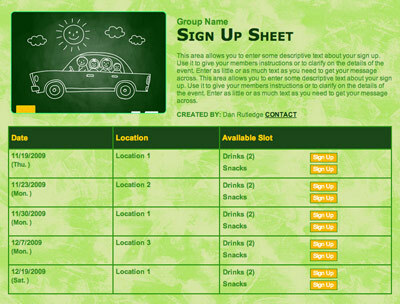 Select activities where you have someone with whom you can carpool. 20. Adding sports to your child's calendar may complicate your life, but it is well worth it! 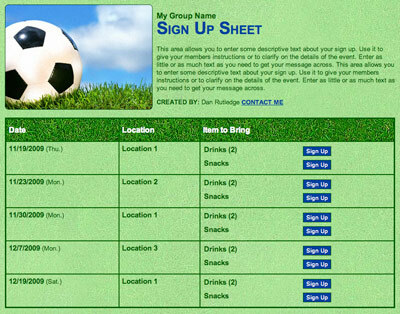 And of course, SignUpGenius will help make the job easier if you are coaching or volunteering as a team parent. Coordinate snacks, carpools, and team parties in a snap - check out SAMPLES HERE! Diving into the school year with a positive attitude and these tips will help you and your children kick off a new year with confidence. Teachers and coaches will thank you, too! "Back to School," as a teacher, and now as a parent is an exciting but also stressful time for me! These tips are great reminders, and I got a few new ideas too. Those tips are really helpful especially my kids are going to kintergarden this year. Organize Class Donations Easily with SignUpGenius!